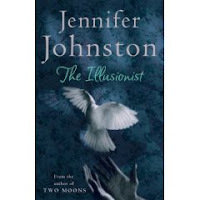 The Illusionist is the third book I’ve read recently on the theme of illusions. The Magician’s Assistant by Anne Patchett was the first followed by Paul Auster’s The Book of Illusions. Of these three I found The Illusionist the most satisfying. Jennifer Johnston is a new writer to me, but from the biographical details in the book I see that she has won many awards – the Whitbread Prize in 1979, the Evening Standard Best first Novel Award in 1972 and was short listed for the Booker Prize in 1977. I’m sorry I haven’t come across her books before, but I’ll be looking out for them from now on. Once I started this I stopped reading the other books I have on the go and read this through in about two sittings. I wanted to find out what happened and why. Set in Ireland and England, it starts with Stella, looking back on her life after the death of her estranged husband, Martyn. Thirty years earlier they had met on a train when he had taken the book she was reading out of her hands and asked if she would like to play cards. Now if a stranger had done that to me I wouldn’t have been too pleased but Stella is charmed by him, and after a very short time they are married, against her parents’ advice. Martyn has a full time job but practices magic tricks, although he corrects her description of him as a conjuror – he is an Illusionist. However, it’s not long before she begins to have misgivings, particularly when he won’t tell her anything about his background or his job or what is in the locked the room where he is devising an extraordinary new trick, with the help of two mysterious men. The situation gets worse as Stella is manipulated and controlled by Martyn, so much that she gives up her own job and they move with their daughter, Robin to a large house in the countryside. Eventually, as things become so bad and Robin is alienated from her mother, Stella has to take action. Out beyond Clifden the world seems to end: hills, islands, clouds drift together in the huge ocean of the sky. Sometimes the sun overwhelms both the sea and the sky with its glitter, sometimes pillars of rain move across the emptiness, then the colour, the texture of the land and sea change as the rain falls, from blue to grey, sometimes to black. Other times a shawl of mist hides mountains, sea and sky. Some words lurk in the darkness of your mind, like young men lurk in the shadows, waiting to damage, maim, or merely frighten unsuspecting walkers once the light has gone. Words can be like missiles or rose or travellers to another world. You can play delightful games with them, that will make you and others smile, feel light-hearted, or you can kill; you can hide the truth or manifest it. Beautiful! This sounds like a fantastic book, both for the beautiful words and for the fascinating story. Like you, Johnston is a new name to me. Where oh where am I going to find the time to read all these wonderful books I keep discovering? Heather, I’m glad it came over as a fantastic book – I think it is.Lisa,thank goodness there’s always good books to discover.Ravenousreader, I hope you enjoy it as much as I did.Table Talk, I couldn’t agree more. I think I’ll have to stop reading blogs for a while – only joking! I’ve never heard of this book, or author for that matter. Teriffic review – I am definitely interested in this book now.